Our first Greenmarket walk of the season! Always a popular one, not the least because of Health Bucks! We emphasized the connection between nutrition and fitness. There is a lot of “information” out there about what food you should eat. Some of it is good advice, but a lot of it is intended to sell products instead of make you healthier. We endorsed the simple advice popularized by Michael Pollan: “Eat food, not too much, mostly plants.” This is a good starting place for eating an appropriate amount of calories by avoiding foods and beverages with extra sugar added. Speaking of extra calories, many people are concerned about being overweight. Excess weight is difficult to lose. Our bodies tend to hold on to calories in the form of fat. Even though diets are unlikely to work, the good news is that fitness is also important. Even with too much weight, your fitness makes a big difference for your health and happiness. So how do you stay fit? Walking is a great thing. Even just 150 minutes per week (about 20 minutes/day) of moderate physical activity can make a big difference. And an hour a day has additional health benefits for kids and adults. That’s one of the great things about Cada Paso! We walk! 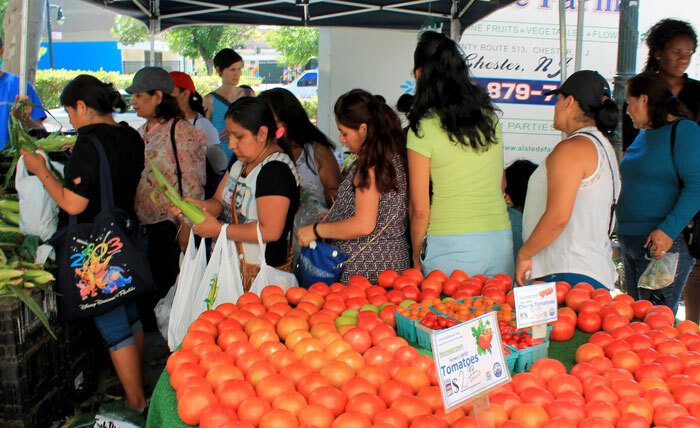 We walked to the Lenox Greenmarket, administered by Harvest Home to spend our Health Bucks. And then we headed over to Chenchita’s, our favorite community garden, to enjoy the green space. We watered plants, weeded, grilled our food and played. Always a great experience!